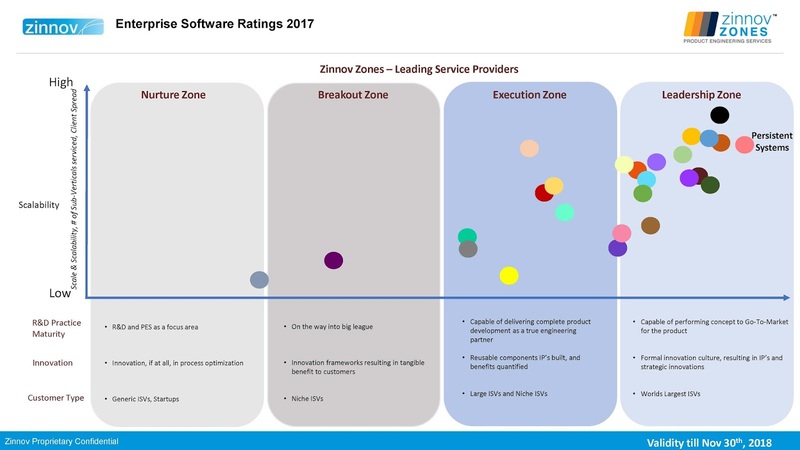 In its recently released report ‘Zinnov Zones 2017 for Product Engineering services,’ Zinnov positions Persistent Systems in the leadership zone for ‘Enterprise Software’ and ‘Consumer Software’ for the fifth consecutive year. Persistent is positioned as “Established and Niche” for overall product engineering capabilities – in line with the company’s focus on software–driven businesses. "Zinnov Zones 2017 – Product Engineering Services” rates 40+ service providers on their product engineering prowess. Service providers are assessed based on multiple dimensions such as spread and maturity of delivery and services capabilities, scalability, growth rate, financials, innovation & IP, ecosystem linkages and feedback from enterprise buyers. This rating represents the company’s positioning with respect to other service providers based on a detailed assessment across dimensions such as delivery and services capabilities, spread & maturity, scalability, innovation & IP, ecosystem linkages, and feedback from buyers.